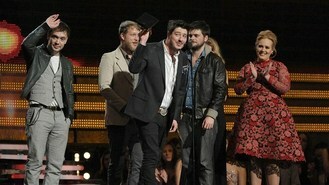 The London folk-rock band scooped album of the year - arguably the top award of the night - with their second album Babel. The coveted win surprised even the band themselves. Lead singer Marcus Mumford, who picked up the award from Adele, said: "We figured we weren't going to win anything because The Black Keys have been sweeping up all day, rightfully so." Adele continued her run of success picking up the award for pop solo performance of the song Set Fire To The Rain (Live), which features on her best-selling album 21. The pop singer picked up six awards at last year's Grammys following the release of her second album. The new mother is due to perform her Golden Globe-winning James Bond theme Skyfall at the Oscars and has already begun work on her third album. At the ceremony in Los Angeles veteran singer-songwriter Sir Elton John teamed up with Ed Sheeran, to perform the hit A-Team. No stranger to Grammy awards, Sir Elton dedicated the performance to the victims of Sandy Hook Elementary School shooting last December. Former Police frontman Sting also took to the stage to pay tribute to reggae star Bob Marley, and collaborated with American singer Bruno Mars performing their hits Locked Out Of Heaven and Walking On The Moon together. Sir Paul McCartney won his 15th Grammy when he took home best traditional pop vocal album for Kisses On The Bottom. It was his first solo album to win the top honour in its category. Another top winner on the night was Belgian-Australian Gotye who picked up record of the year for Somebody That I Used to Know, which features Kimbra. Emerging American indie-pop act Fun scooped up two Grammys for new artist and song of the year.